2 Place walnuts on a baking tray and roast in oven until just turning brown. Set aside and allow to cool. 3 Place the spinach and rocket leaves in a large mixing bowl. Add the cherry tomatoes and top with the Hellmann’s Classic House Salad Dressing. Mix well. 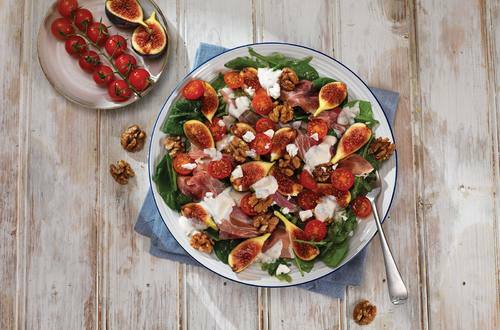 4 Spoon onto serving plate and top with the figs and strips of the Parma ham. 5 Serve sprinkled with roasted walnuts and crumbled feta cheese.